To-Be-Bride ? 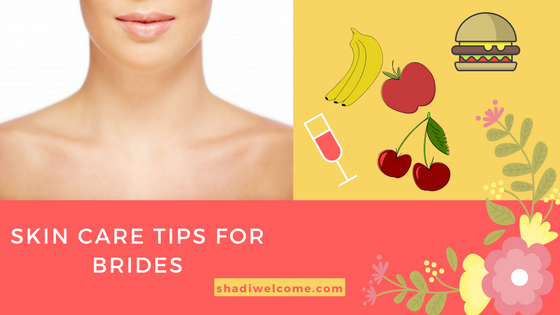 Better Take Care Of Your Skin | Shadi Welcome Pvt. Ltd.
Apart from your bridal outfit, your jewelry, accessories and shoes, everyone’s going to expect a big bang surprise regarding your facial looks. And yes, makeup artists would swipe their magical hands on your face to make it perfect beauty, but the base should be right as well. The base of your facial beauty is your skin, which is going to give you a radiant look. So you better get your skin prepared before your wedding day actually comes. Now the point to worry about is what to choose to achieve your goal? It’s the most difficult task to decide what’s right and what’s wrong for your skin. So to start up with, look at your budget if you could spare some amount for your skin or not. Otherwise there are a lot more options and home remedies to make your skin better and healthier. Sleeping routine matters a lot when it comes to skin care. You need to set up your sleeping hours between 6 to 8 and a real good night sleep daily, not occasionally. It’s been a trend to sleep late night these days as we have set up our lives this way. But your wedding is actually more important. At least till your wedding, sleep early and wake up early, to look good and become healthy as it will reward you really well after your marriage. This will help your skin to take a good rest and it will flourish in time. Try to make this routine and you will see the difference in just 1 week. Depending on your budget, if you can and want to spend some amount in this regard, you must see a dermatologist. This way, you would have a professional assistance and much easier for you to decide how to move on with your skin care expedition. No need to mention here that how junk food is ruining our health and skin. A lot of researches have been done in respective field. But unfortunately, nobody can stop its hand when see a yummilicious juicy burger lying idle on the table and asking to be eaten innocently 😉 it’s the matter of life and death for that burger maybe, but for you as well as far as your wedding is concerned. Do remember that junk food is the most harmful thing when it comes to skin care and healthy life style. It’s like a drug and you must try to keep away from it till your wedding day at least. I know you won’t like to leave this apparently delicious food, but you won’t either like to look chubby or fat with blurred skin on your wedding day. Skin health is directly proportional to water intake… statement to be true! Increase your water intake, and will turn out to be 50% of total efforts to make your skin healthy and fresh. So literary count the glasses of water you drink every day, and increase them anyway. This will purify your skin and help removing toxins from your body. Coming straight to the point, increase vegetable consumption and cut out the red meat and chicken. Take every kind of meat once a week only. Add more fruit and vegetables to your diet, dry fruits and fibers as well. Say no to soda drinks and eat greens more. It’s not recommended to eat salads only nor advisable, but consumption of all the vegetables in cooked and raw meals is extremely beneficial for skin. Keep your stomach happy, it will keep your skin happy. This is the key to happy and healthy skin. With all the above mentioned points, provided if you follow them, your stomach will stay healthy, so will your skin. A good night sleep, increase water intake, cut down of junk food and green veges consumption will let your skin rise and shine like never before. Shadi Welcome Pvt. Ltd. © 2017.